1. Download the zip containing the game via the link above. 2. Right click on the zip file, and choose "extract here". 3. 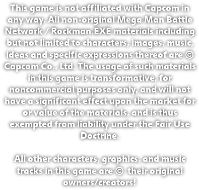 Click on "MegaMan Battle Network Chrono X.exe". Enjoy! Use the included ConfigTool to change the default controls. For additional troubleshooting, see the FAQ.